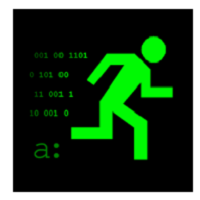 Hack Run for Mac from i273 is a hacking simulator game that has elements of puzzle. If you’ve ever had the urge to hack into a computer and look into other people’s stuff, this game should be worth a look. Fortunately, you don’t need to learn programming to play this game. You play the role of a hacker who is trying to break into a company’s computer network and get some dirt. Unlike games today with flashy graphics, Hack Run consists of a black background with lots of green text, and a lot of puzzles. You also have to do more than a bit of reading. While that doesn’t seem like much, Hack Run is actually very addictive, and there’s a certain pleasure you get from reading email from the company personnel. In addition you also learn how the major players in the company are connected, making it very immersive. You won’t just learn company data, but also some nasty little secrets of its employees, adding to the fun. If you’ve been using computers for a while, the game will bring back memories of the time you used command prompts, as that is what you’ll be using here. Part of the fun here is learning the commands used in each of the systems so you can progress. Although there are no fancy graphics, Hack Run is very absorbing, and the riddles and clues will have you wanting more. Bottom line: this is an engrossing game and you don’t need to be a hacker to enjoy it.